I know I waited a long time to post these Starbucks Copycat Quinoa and Black Bean Wraps, but they were a little ways down my queue of blog posts. But here they are! And I’m finally home! Well, actually I haven’t gotten back to Toronto yet, but I’m just bumming at my grandparent’s house because it’s Labour Day, the grocery stores are closed, and Lisa has no food in her apartment. But it definitely feels good to be back in the city where the water is predictable, there aren’t spiders and wasps everywhere, and I’m not constantly covered in gravel dust or sweat. I always love going to camp for two weeks because I get to work with kids that are so great, talented, and more-or-less well behaved. I learn so much about other people, myself, and life. It’s so nice to reconnect with the other amazing people there. There is so much positivity there, and as someone who leans more towards the pessimistic end of the spectrum, it’s always refreshing to be surrounded by people who are just so happy, positive, and full of energy. The downside is that it’s such an exhausting two weeks, both physically and mentally, but I always look forward to the second week because the girls who end up in my cabin are always so bright, polite, and amazing individuals who are beautiful both inside and out. They always make me think back to what I was like when I was their age (which wasn’t actually that long ago, but it’s been about 6 years). So much has changed since then, and I’m interested and excited to see how they grow up and become amazing and brilliant adults. I’ve learned a bit about myself over these past two weeks as well, and I’ve done a ton of soul searching and reconnecting with my body. There are going to be a lot of changes in my life, and I can’t wait! 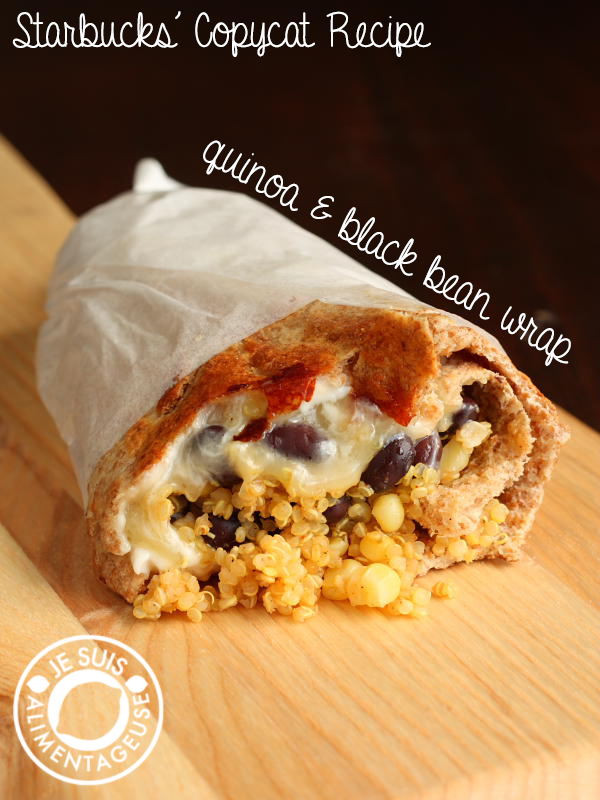 In the meantime, enjoy this delicious Starbucks Copycat Quinoa and Black Bean wrap. I had it not too long ago at Starbucks and it was DELICIOUS. But it was also 9 dollars, which was a little steep for a skinny little wrap. I was so hungry that I bought it anyway, but you could easily make 3 wraps for the price of 9 dollars. So that’s what I did. Hope you like it! - Creamy Havarti Cheese or Daiya Pepperjack cheeze. Cook the quinoa by combining quinoa, water, paprika, chili powder, garlic powder, onion powder, and cayenne powder in a small covered pot over medium low heat (My stove dial is from 1-8, I usually have it around a 3). Let simmer for 20 minutes, DO NOT LIFT LID before 20 minute mark. Once the quinoa is cooked, remove from heat, fluff with a fork and drizzle lime juice over the quinoa. Mix in the corn kernels and black beans, add salt to taste, and set aside while you assemble the wrap. Preheat a pan (or skillet) over medium heat. Open up your pita and spread some veganaise/mayo inside. Add daiya cheeze or havarti cheese and then fill the pita with the quinoa filling. Roll the pita, then wrap/secure with parchment paper by taking a fairly large square, wrapping it around the pita, and then twisting the bottom to keep intact. (I wrap it with part of the pita poking out, so I can eat it while holding the parchment paper). Cook the wrapped pita on the skillet, rotating until the pita is somewhat crispy and golden, and the pita is heated through to melt the cheese or cheeze. If you want the same sort of bread that Starbucks uses, use a form of naan bread (you may have to cut some sort of makeshift pocket or gingerly fold it into a wrap) to get that same chewy texture. Thanks Amy! I'd probably have it more for a lunch, but hey, I eat cheerios for dinner sometimes haha. Food is food! Haha thanks Shari! Ummm I can't remember which font exactly, I think it was Eyes Wide Open..? I know it's by Vanessa of "By the Butterfly" and her fonts can be found on dafont.com. Thanks! The pumpkin latte is delicious too =) good choice. it took exactly 2 seconds for me to fall in love with your page/blog/whatever you call these things now. I will be making the quinoa wraps tonight and can't wait to check out the rest of your information! :) Much love, Quinoa junkie! Hahah food blog, website, compilation of random recipes! Whatever works =P Thanks for reading Laura and thank you for the comment! Let me know how the wraps work out for you. I recently experienced a Starbucks Quinoa and Black Bean Wrap and immediately fell in love with it. I'm pretty excited to have found your recipe for it and have been meaning to try it for a few days now. However, the editor in me has compelled me to let you know that in your recipe, you have misspelled "Vegenaise" and noticed in your About section that you would want to know this. Have made this a few times from your post and I LOVE it!!! So does my 14 year old daughter. Have made this a couple times now and it is so delicious! Thanks for the recipe. I found it on Pinterest. Thanks so much for coming back to comment =) Happy Holidays! Have you made these ahead of time before? I don't have all the time in the morning for preparing and was looking for something so just grab and go. Could I make 3 or 4 at once and then be able to grab one in themorning, heat real quick and go? I'm always looking for a healthy breakfast that isn't sweat. I personally haven't done it myself, but what you can always do is prep the filling before hand and just stuff and cook em up them in 10 minutes before you head out? I made this & absolutely loved it! I substituted a few things to customize it more to my liking; I used sour cream & salsa instead of mayo, jalapeno Havarti & switched it up to a plain tortilla wrap and pan fried it in a little bit of butter.